Northborough – Two fun traditions and highly anticipated events of the annual Applefest weekend are the parade and the street fair. This year’s plans for both will not disappoint during the 28th fall festival being held Thursday, Sept. 13, through Sunday, Sept. 16. 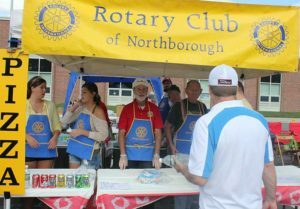 The Northborough Rotary Club is preparing for the Street Fair on Blake Street, which will be held Saturday, Sept. 15, from 10 a.m. – 3 p.m. (rain date is Sunday, Sept. 16, from 11 a.m. – 4 p.m.). The Rotary Club strives to produce a balanced fair each year. No will go hungry either with many options for food including friend dough, French fries, pizza and kettle corn. Chick-fil-A and their mascot will be there as well as Red Hot Tavern restaurant. A group of exercise and martial arts exhibitors, in addition to dance studios and chiropractors will be present. More information on this project and how the community can help will be available at the Northborough Rotary Club’s booth. Doyle said there is always room for one more vendor. She can be contacted at [email protected]. On Sunday, Sept. 16, the parade will kick off at 2 p.m. from Lincoln Street, head down Main Street and end at School Street by the Northborough Historical Society. Grand Marshal Roger Leland will lead the parade. Over 70 registrants are scheduled to march. In addition to the Dixieland Band, Soular Jazz Band and Algonquin Regional High School, spectators should be on the lookout for the Shriner’s Mini-Haulers, Irish dancers, political candidates, town officials, businesses, organizations and school representatives. An Applefest tradition, kids should be ready to catch candy that will be tossed out to them by parade participants. All Applefest events and activities can be found at www.northboroughapplefest.com.